The Sports Series is gearing up to be a real money maker for McLaren. Given how well seated the McLaren marquee is in the supercar world, it’s easy to forget that it’s still a fairly new automaker. Just a generation (or two) ago, McLaren debuted the Ferrari 458 fighter known as the MP4-12C and learned that a car must be more fun to drive...and easier to pronounce. However, things are looking up for the young automaker and now it’s feeling confident enough to start carving out its own path, it’s offering a bevy of options for said sports cars. High dollar options like the P1 and 720S are the fan favorites, but McLaren also wants to give Porsche a reason to worry with its Sports Series line, which is made up of the 540C, 570S, and 570GT. Like Porsche, McLaren wants these cars to sell like hotcakes and has priced them accordingly, but following ze Germans means giving the buyer the option to inflate the sticker price with options. New for the Sports Series is a range of options and accessories designed to protect the car’s appearances (and therefore value) and give the owner more ability to personalize the car. Offered are indoor and outdoor vehicle covers, branded floor and luggage bin mats, and front skid plates (necessary for city-bound vehicles). These are optimized to protect the aerodynamic diffusers from scraping on curbs. Personalization options require a deep breath to list. Ready? Good because McLaren is ensuring that no two Sports Series models are alike with side skirts, mirror castings, side intakes, aero blades, a front splitter, rear bumper, rear wing, rear diffuser, and rear deck and plenum cover all made of that elusive carbon fiber stuff we all know and love. These elemental eye magnets aren’t just there to snap pedestrian necks when passing by in traffic either, all weigh less than their standard equivalents and therefore make better use of the car's already high horsepower budget. Inside buyers can decide to treat themselves with colored seat belts and a carbon fiber steering wheel with extended gear paddles and a leather or Alcantara grip. More carbon fiber is available too of course, with the option to have the switch packs and IRIS surround, upper speaker surround, side tunnels, and the McLaren-branded sill finisher all made of the stuff. 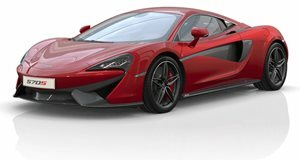 And just like BMW’s M and Mercedes’ AMG divisions enjoy throwing bones into the parts catalogue of non-performance models for looks and a mild increase in performance credibility, McLaren will allow Sports Series buyers to pick and choose MSO-branded parts including a front splitter, rear wing, and rear bumper. Rest easy if you’ve already taken delivery of your car because these options can be fitted to existing vehicles at a McLaren retailer or added to those that have yet to leave the factory. Try to restrain yourself.